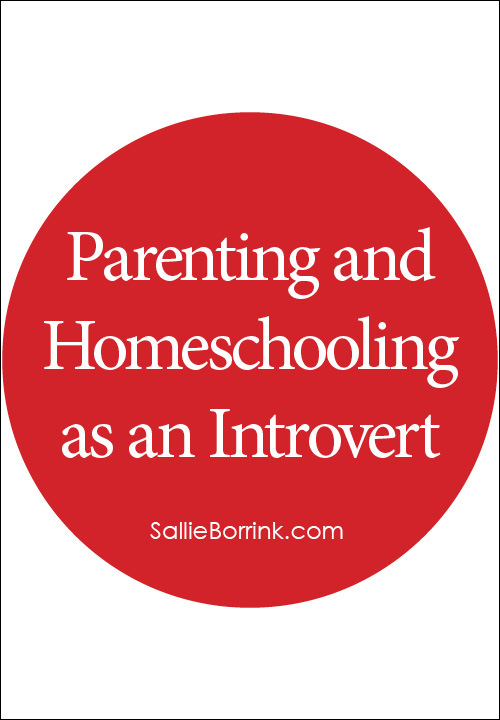 “Parenting and Homeschooling as an Introvert” was originally posted August 11, 2012, on my previous blog. Caroline was almost six and I thought that she was an extrovert at the time. I’ve since concluded that she’s more introverted, but did not alter the original post to reflect this. I’m posting it now to add it to my 31 Days of Learning Differently series. The past few weeks have been hard. I hit the proverbial wall this week and it all had to do with being so strongly introverted. 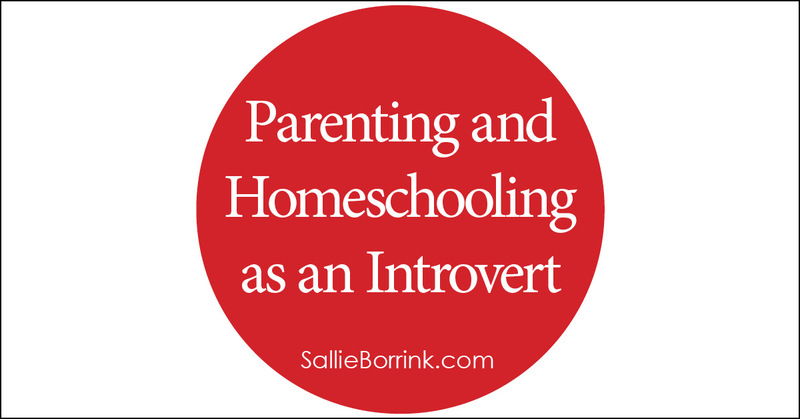 Parenting and homeschooling as an introvert is hard. On the bright side, I think God allowed me to realize something in the midst of it. Singleness and childlessness were two of the hardest things I’ve ever experienced. Parenting is the hardest thing I have ever done. I struggled with singleness and childlessness. Those seemingly never-ending years were an important part of my faith journey, and God used both of them in significant ways to shape me as a person. But in the midst of them I never really felt like I had any control over the situations. I could pray and wait and trust. It seemed that the overall theme that kept rising in my life was that God was calling me to patience and waiting in the midst of each situation. But the parenting thing. This feels different. I’m not waiting on God to move and change something. It’s something I have to get up and do every day. And it is challenging in a completely different way. Yes, I need to rely on His power in my life to parent well. But it is still different than the paths I walked before. And so far I don’t see an overall theme coming forward to give me encouragement and confidence that I’m on the right path in my thinking about the situation. The past couple of weeks have been full of people and devoid of any meaningful introvert time for me which is a sure recipe for disaster on pretty much every level. I started searching for articles online about parenting and introverts and found some gems. I felt encouraged after reading them if for no other reason than I knew afresh I wasn’t alone. I also appreciated a discussion I found on Mothering.com that tackled Introversion and Parenting. I related to many of the comments. A few years ago – well, probably around ten years ago, now that I think about it – one of my older sons asked me what my favorite day of the week was. The first day of school after a long summer is the highlight of my year. I would walk back to my car saying ‘Free at last, free at last. Thank God Almighty I’m free at last!” Have you ever read ‘Party of One: The Loners Manifesto’ by Anneli Rufus?? Some of it is a stretch but I liked her description about spending hours with friends would leave her feeling drained, like she had donated blood..all day long. On days when everyone is around all day, I must stay up later than everyone in order to feel like I exist. I don’t mean that overdramatically, I just mean that my self doesn’t feel really connected until it’s…quiet and I can process stuff in my head. My oldest son is an extrovert. I mean…he’s an extreme extrovert. It took me a long time to figure this out. It all finally came together for me in the aftermath of doing one of the Myers-Briggs inventories (for school, of course. So we could all get along, etc.) and observing him during one more aggravating trip to the grocery store in which he could not, would not leave either his brother or sister alone. It finally hit me, “If he’s not interacting with someone, he doesn’t feel alive. ” And I grasped the corollary of that which was that I feel most alive when I’m alone. And we were going to have to figure out a way to co-exist. This is EXACTLY where I am with mothering Caroline. Bless her little extroverted, only child heart… She wants interaction ALL. DAY. LONG. The other day we took her to the Children’s Museum in the morning and then we ran some errands. When we got home mid-afternoon, her tank must have been full because she actually went into the learning room and was fully engaged A.LONE. for the better part of an hour. I vacillated between total shock and thanksgiving. But it took all of the attention from me AND David until three in the afternoon before she got to that point. We simply cannot do that every day. And bedtime… If she doesn’t have her word and interaction quota met… She CANNOT go to sleep or stay in bed. Drives me nuts to no end. And, yet, I’m the same way on the opposite end of the spectrum. It’s past midnight and I should be in bed. I want to be in bed.But I’m sitting here typing because it is finally quiet and I can finally find a way to bring some life back into my introverted self. I can’t go to bed until I’ve had my introvert time.She can’t go to bed until she gets her extrovert time. I have no idea how this is going to work. I’ve asked myself more than a few times lately if I am simply incapable of homeschooling and being a healthy person. And yet I believe with every fiber of my being that homeschooling is the best thing for Caroline even though she is an extrovert. The older I get, the more extreme my introverted side becomes. I’m often accused of being an extrovert because of my occasional public speaking but alas, I’m a true INTJ. I crave, crave, crave alone time. I’m totally introverted. And as time goes by the stronger that side of me becomes. I think it just has to do with getting older & wiser and figuring out that people don’t hold the answers or any real comfort. My disillusionment with mankind (and I say that in the nicest way) makes me more introverted. Which is often hard when you’re homeschooling 3 kids. We stay home. A LOT. I don’t do this and that activity anymore. I don’t go to homeschool “support” groups because I figured out real quick they’re mainly a measuring stick for everyone else to feel better about themselves/their kids/etc. Or a gossip squad. Very little support. I loved the Monday Morning quote above – it is so true! Lindsey – Just thinking out loud here… Do you think you are more introverted because you are getting older or because the world is getting more stressful? Or because your world has gotten more demanding? I also feel like I have become much more introverted over the past ten years or so, but I’m not completely sure why. I think the world has gotten so much more complicated and that does contribute to it on some level. Or maybe I’ve just always been this introverted, but I never had as many demands on my time and energy so I feel it more acutely now. I’ve always been perfectly happy to spend hours every day alone, even when I was a child. (But not all day!) I always wanted to be by myself during recess to read a book or something in elementary school. People were always telling me to go play with the other kids and I didn’t want to do that. I wanted to be alone, even then. When I was a teacher I remember the principal making the point that planning time was for planning and working, not taking a break. I never used all of my planning time for planning. If I had done that, I would have never made it through the day. And, frankly, as long as I was doing my job I didn’t think it mattered when I did my planning. If I wanted to take it home in the evening, what did it matter as long as it got done? Oh Sallie, thank you for this post too. Thank you for articulating that parenting is about the parents as well as the child(ren). The relationship has to work for both parties, not just the child. I’m not the super playful mother either. I’ve never been into pretending and open-ended imaginative play even though I think both are really important for children. Now if we’re talking board games or coloring… I’m your girl! And I’ll read books until my voice gives out. Thankfully David IS more playful, but unfortunately he ends bearing the bigger part of that load which sometimes makes me feel badly. I will play with Caroline, but I would rather DO something with her, if you know what I mean. I’d rather go shopping, go to the library, do a specific craft, etc. Really good questions Sallie and I have to say I don’t know, but I bet all 3 scenarios play a role in my upped-introvertedness. I think the world is more difficult. It has to play a role in it, I think. The constant relying on technology makes it worse for me, I think. I feel like half my relationships aren’t really “real” and I crave solitude because I just don’t trust people. For instance, I never talk to my brother & sister in law because they’re just “too busy”. The only way they communicate with us is by text message. EVER. And we see them at Christmas, and that’s it. It feels so superficial, so why try to “bond” with them, even if they are family? I could talk about this forever, I think. When I was a kid (an only child too) I remember all my friends would go spend the night with each other for days on end – like for a whole weekend. I could not do that. Ever. First, my parents wouldn’t let me, but beyond that I didn’t WANT to. One night at a friends house was enough for me and sent me into sensory overload. I absolutely wanted to go home and be in my space, alone, with my things. I always felt a little odd about that…but looking back, I see it was my introverted side. Yes, the demands are much higher on me these days. Gotta play a role too! Sallie, I think you and I are very similar and my husband and yours are very similar. My DH is definitely my son’s favourite parent now, but I also hope that one day my son will appreciate me too. I need a minimum of an hour a day alone–though I’ll take much more than that if I can get it. But sometimes if I have too much time away from dealing with small children, I have a very hard time transitioning back into it. I find that breastfeeding, etc. help me to cope somewhat, because they promote bonding hormones that mellow me out a little. Also, my spending attachment time alone with the youngest has forced the older two to be a little more independent of me. I’m glad that they have each other to talk to!! My Youngest is an extreme extrovert, the rest of us are introverts. I feel so bad for him sometimes. (other times I can’t muster the energy to feel bad because he drained it all) it really helps when he goes over to my brothers house to help with my neices. their youngest is also an extrovert and it seems like they only need each other to fill up their interaction buckets. maybe a young neighbor or another homeschooler could come over and interact with Caroline for a couple of hours a week. could be a win win for you and the other childs mother. I don’t think I could have survived my sons toddlerhood if he had been an only. Maybe a pet would help. my son spends hours talking to his dog. Imagine the poor introverted baby, whose mother is determined to attachment parent, and who only wants everyone to get out of her face. Frankly, Sallie, even as an “extrovert”, I still can’t take non-stop activity and noise all-day, every-day as a mom. I still need down time. And all the kids… even my over-the-top extroverts do too. Truth be told, we are all (even the most off-the-charts extrovert, or the most off-the-charts introvert) better off to have some time with people, interacting meaningfully, and better off to have some time in silence/solitude. Both every day if possible. We have consistently had a daily quiet time for this purpose. It is simply unhealthy for any parent or child to either (a) cut themselves off from people and be emotionally detached or unavailable, or (b) be completely enmeshed with another person and be unable to spend time in silence/solitude. It is healthy for both parents and kids to have both… time for connection and time for reflection. All of our children (and I have some extremes… one child who is very introverted, and three children –that I can tell so far, as I haven’t yet decided about the 2yo– who are extroverts, one of whom is fantastically extroverted) benefit from having quiet time daily. And so do I. I can’t imagine being a mother without some silence to myself on a regular basis. And again, I’m saying that as a lifelong extrovert. We are all better off. I don’t just think this is an issue for introverts, I think it’s a matter of balance and healthiness in any/every family. Everyone needs to learn to yield to the needs of others, including children realizing that their mom/dad are people and also get overwhelmed, tired, stressed, and have needs, etc. That, to me, is part of the refining process God intends for us as family members, sharpening and shaping one another in daily life. I’m SO GLAD you found this post and it encouraged you! It is hard when you are doing it alone without a strong support network around you. You mentioned your husband spends a lot of time helping at church. Is there any way he can back off some of those commitments in order to free you up more and give you more time together? I’m a firm believer that our family is our first ministry, especially when our children are little. Don’t ever feel badly for taking care of yourself. It’s not selfish. It’s a true need, especially for people who are highly sensitive and introverted. People who aren’t that way truly don’t understand what it is like to live in that kind of a body/mind. With so many little ones needing you, you need to take care of yourself so you can be there for them. Adding in health problems makes it even more important. I hope you will look around my site. I have quite a few encouraging posts for moms, introverts, etc. Hello! I know this is an old post, but I’d love to hear how you are getting on. I am an introvert with a 9 year old son who so far seems like an extrovert – if he is an introvert he has a very high level of need for interaction – and because I have a chronic illness as well, I get tired very very easily from super engaged activities- I will start my day hoping to do like 3 interactive homeschool activities with him, but after 1 I am so pooped I have to lay down for 2 hours and try to think of something to keep him engaged that isn’t just watching tv. Thankfully he’s very good at playing and doing stuff on his own as well, he builds legos constantly, writes long journals with pictures, draws very involved pictures etc so he can be quite self directed which is great, but I still find myself feeling guilty that I’m not doing a lot more WITH him each day that’s super interactive and talking a lot- Ijust can’t seem to do manage it! So it’s encouraging to read about other moms who are same.I do need my alone time for sure. I love to cuddle with him and I read aloud to him everyday for probably an hour, andthatI like, but conversations that go on and on, or the standard “teacher talking and teaching stuff” type of interaction seems to knock me out flat in like 20minutes! But he seems to have learned a lot so far anyway,so I guess it’s working. Thanks for this post! You are welcome! Old posts on my site get comments all the time and they are welcome! Every year has gotten easier, but I don’t think parenting or homeschooling will ever be “easy” for me because of my strong introversion. I could happily be alone with my thoughts for hours every day and feel most alive/healthy when I get that. But with a daughter at home and a husband who is self-employed, that simply isn’t going to happen. So I’ve had to learn how to cope with it. Caroline (currently 12) uses electronics far more than I would have thought I would let my child. Some of the online games/activities such as Minecraft are an excellent fit for her and so I let her enjoy them. David also spends quite a bit of time playing with her every day. Much less now than when she was little, but that parenting task fell primarily to him. Honestly, we just kind of muddled through one day, one week, one month, one year at a time. There was no readily available blue print for our family so we just did what we needed to do each day. We prayed a lot for guidance and that we wouldn’t screw up our child. Thankfully we all have excellent relationships with each other, but we continue to work on it and prioritize it. All that say, I don’t get my introverted needs met. I try. David tries to free me up. Caroline is even old enough now to understand why I need it. (That was also a big turning point a few years ago when she was old enough to understand the introvert concept.) But parenting and homeschooling drain me. There is no way to wish it away or spiritualize it. It wears me out and I rarely get to fully recharge. So I just keep going. There isn’t any other option. So that’s the honest truth.